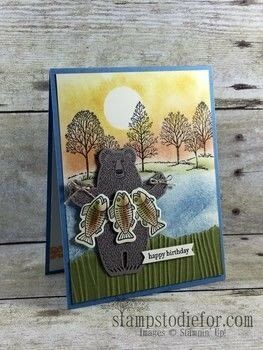 The Bear Hugs Stamp Set makes stamping some outdoors cards so much fun. Masking and sponging is an easy technique to give your cards some great dimension and interest. All Supplies Stampin' Up! Sizzix Big Shot Bear Hugs Stamp Set Lovely as a Tre Stamp Set Old Olive Cardstock 2" x 4" Tip Top Taupe 3" x 4" Early Espresso Classic Stampin' Pad Marina Mist Classic Stampin' Pad Old Olive Classic Stampin' Pad Cajun Craze Classic Stampin' Pad Crushed Curry Clasic Stampin' Pad Sizzix Big Shot Bear Hugs Framelits 2 Wood Grain Embossing Folder Sponge Daubers Stampin' Dimensionals Glue Dots Card Base 4 1/4" x 1" Very Vannilla 4" x 5 1/4"
Fold the 4 ¼” x 11” in half to create card base. Stamp a row of trees in Early Espresso Ink across the Very Vanilla Cardstock about 3” from the bottom. Then punched a 1” circle out of a post-it-note and stick it where you want your sun. Sponge the Marina Mist Ink for the lake, Old Olive Ink for the ground, Cajun Craze Ink for the lower part of the sunset and Crushed Curry Ink for the top. Remove the post it note and you will have a cool sun! Tear about 1/4" off the top of the 2” x 4” Old Olive Cardstock for the grass and ran it through the big shot using the Woodgrain Embossing Folder and adhere to the bottom of the Very Vanilla. 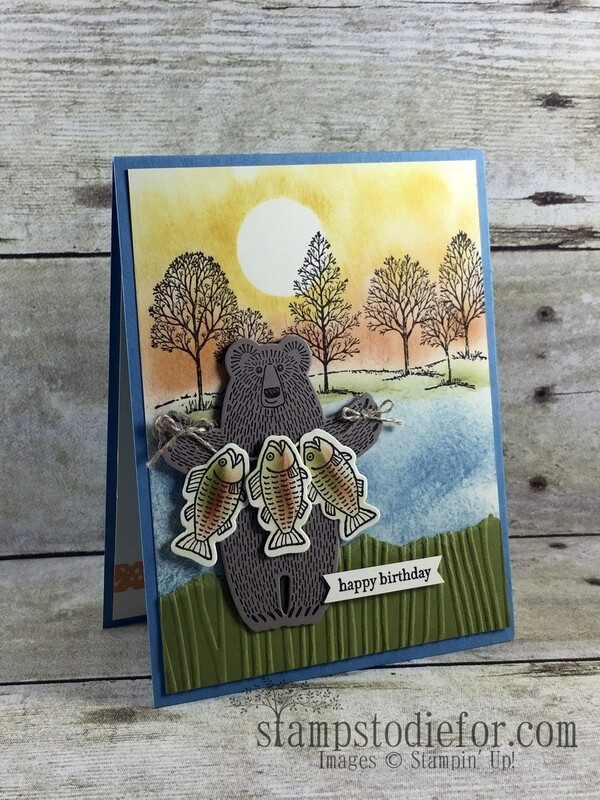 Stamp the Bear in Early Espress on the Tip Top Taupe Cardstock and cut out with the coordinating Bear Hugs Framelits, attach him to the card front using dimensionals. Stamp three fish in Early Espresso on Very Vanilla Cardstock and cut out with coordinating framelits and sponged with Old Olive and Cajun Craze Ink. I think tied them up with Linen Thread using glue dots and 1 Dimensional for the middle fish. Stamp your Sentiment on a strip of Very Vanilla and adhere to the front of the card with a dimensional.